Do you ever catch yourself changing the typeface, line spacing or the color of the text instead of actually writing? You might want to try one of these: Q10 — Finish that first draft. Now. (Windows only, no frameworks required); JDarkRoom — A simple full-screen text editor. 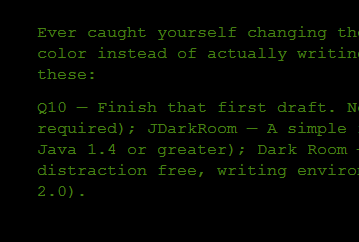 (requires Java 1.4 or greater); Dark Room — Dark Room is a full screen, distraction free, writing environment. (requires .NET Framework 2.0).